Do Visual and Haptic Cues Affect Taste? Executive Editor: Yann-Jy Yang, Chihlee University, Taiwan. Management: Management issues in developing and under developed countries. Ricky	Wong, The Hang Seng University of Hong Kong, Hong Kong rickywong@hsu.edu.hk , https://scm.hsu.edu.hk/us/aboutus/faculty/22 Samuel	Anantadjaya, IULI - International University Liaison Indonesia, Indonesia ethan.eryn@gmail.com , http://www.iuli.ac.id Sustainable: Enduring commitment to environmental principles in business management. Technology, entrepreneur and innovation: Business management enabled by technology, entrepreneur, AI, and innovation. CMR is listing/indexing in Scopus, EBSCO host, ProQuest ABI/INFORM, Ulrich's periodicals directory (http://www.ulrichsweb.com/) and Cabell's Directory (http://www.cabells.com/) of Publishing Opportunities in Management, the Index of Information Systems Journals. 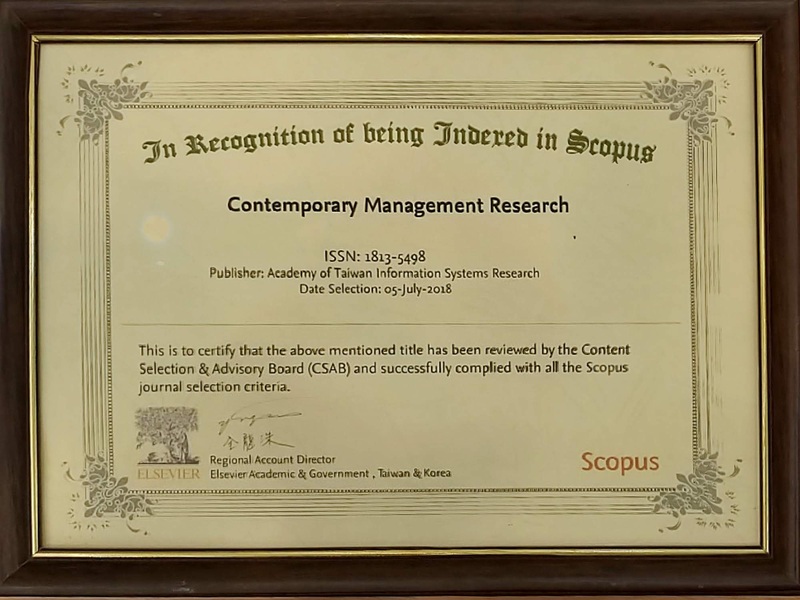 CMR is recognized by Ministry of Science and Technology of Taiwan as B class journal in management field in 2014.